BAYONNE – A federal agency responsible for monitoring ocean conditions says it predicted dangerous waves and harsh winds in the mid-Atlantic Ocean last week, days before before a cruise ship headed into the path of a powerful winter storm on Sunday. The Ocean Prediction Center said it had projected “hazardous seas” in the Atlantic as early as last Wednesday, four days before the storm intensified. In addition, the center issued a series of gale warnings, storm warnings and hurricane-force wind warnings on Friday and Saturday for sections of the ocean along the ship’s route. The Royal Caribbean’s Anthem of the Seas left its port in Bayonne on Saturday and headed south toward Florida, straight into the path of a storm off the coast of the Carolinas. The vessel, one of the largest cruise ships in the world, was rocked by hurricane-force winds and massive waves. 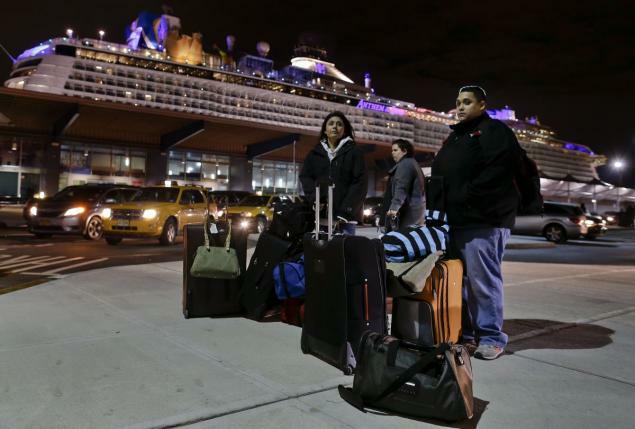 When the ship returned to its home port in New Jersey Wednesday night after aborting its trip, a senior official of the cruise line defended the company’s initial decision to stay on course, despite the coastal storm that was churning in the Atlantic Ocean. Bill Baumgartner, the cruise line’s senior vice president of global marine operations, said Wednesday night that ships as big as the Anthem of the Seas are built to withstand the types of winds that were forecast for Sunday. Baumgartner said wind speeds that day were predicted to be 55 to 65 knots, or 63 to 74 mph. Royal Caribbean officials did not immediately respond to the forecast details released today by the Ocean Prediction Center, which is part of the National Oceanic and Atmospheric Administration. When the incident occurred Sunday passengers took to social media to post photos and video clips of the stormy cruise, and Royal Caribbean officials described the ferocity of the storm as unexpected. That statement drew harsh criticism from weather experts who had been monitoring the development of the low-pressure system days before it mushroomed into an intense storm during a process known as bombogenesis. That’s when the barometric pressure of a storm system drops significantly within 24 hours, causing the storm to strengthen substantially. Those speeds equate to 75 to 80 mph. Sustained winds in tropical storms range from 39 to 73 mph, Category 1 hurricanes range from 74 to 95 mph and Category 2 hurricanes range from 96 to 110 mph. Some meteorologists said there were plenty of warning signs pointing to rough weather, far in advance of the cruise. Sarah Dillingham, a storm specialist for The Weather Channel, said some computer models and meteorologists were predicting the storm would strengthen substantially days before the bombogenesis process actually happened. “If you had listened to the forecast, you know it’s going to start out as a small little storm and then blow up into something huge,” Dillingham said during a recent segment about the controversial cruise on the station’s “Weather Underground” show. Carl Parker, another storm specialist for The Weather Channel, said many people are focusing on the wind speeds that the ship encountered, but the huge height of the waves was also predicted far in advance. “The models were differing a little bit on the intensity of the storm, but we knew there was going to be a storm and we knew it had the potential to be a very strong storm. In fact, one of our best models was really consistently indicating that,” Parker said on the TV show. Three days before the cruise ship left New Jersey, the Ocean Prediction Center was forecasting seas as high as 29 feet in the Atlantic on Sunday evening, Parker said, and the following day the center was predicting waves as high as 31 feet on Sunday night. This timeline shows the offshore forecasts issued by NOAA’s Ocean Prediction Center before the Royal Caribbean cruise ship lefts its port in New Jersey last Saturday, Feb. 6. The timeline was released Thursday, Feb. 11, by a center spokeswoman. Thirty-Three Percent of The Virgin Islands and Puerto Rico Will Be Without Power This Christmas … And Cruise Ship Passengers Do Care … As Do We Here!